But hope has an astonishing resilience and strength. but the ground on which realists stand. Some people claim to have a spirit animal – a creature who, for them, embodies certain inspirational qualities or characteristics. I don’t have a spirit animal, but I do have a few spirit flowers. And one of my special favorites is sweet alyssum. I’ve long identified sweet alyssum as the poster child (as it were) for resilience. Each year, when autumn’s first frost descends, it lays waste the garden – impatiens and begonias crumple, other fair blossoms faint dead away. But not sweet alyssum. While the flowers around her keel over, she holds her head up, spreads ruffled skirts to the cold, and enchants the air with her sweet perfume. I’ve often thought to myself that I wish I could be as plucky as sweet alyssum when adversity comes to call . 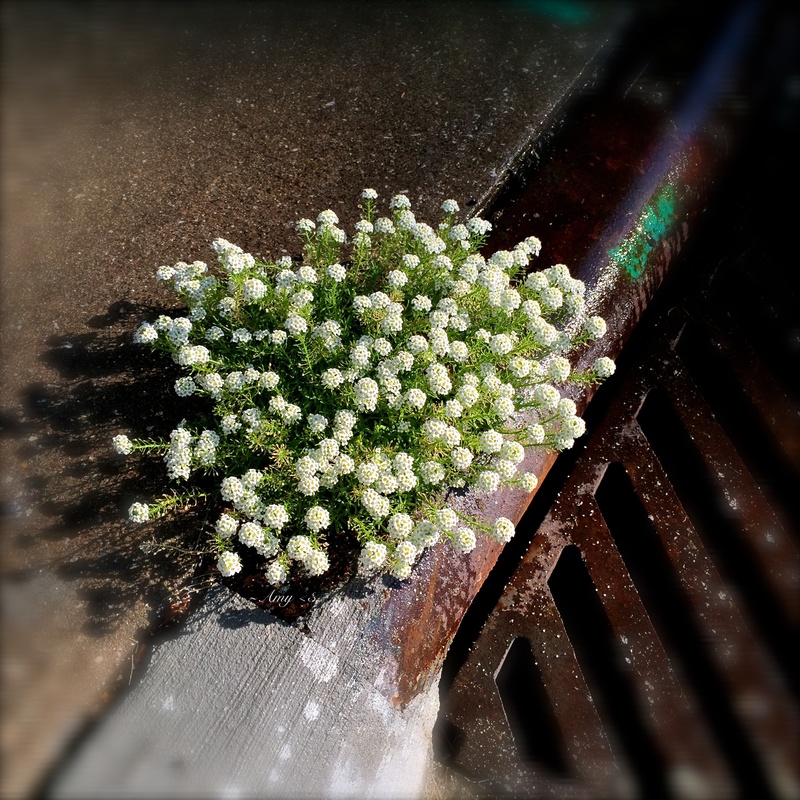 This spring, a seedling of sweet alyssum took root, of all places, in a thimbleful of poor, pebbly soil between the sidewalk and the storm drain in our turnaround. While pulling weeds in early May, I spied the little pioneer, sighed and shook my head at her unfortunate location, and left her to grow. And grow, she did. All summer I watched, with a combination of amazement and admiration, the development of this unlikely little plant. This sweet alyssum is not only resilient, she’s brave. She isn’t luxuriating in a soft garden bed with others of her kind. She’s out there on her own, quite literally between a rock and a hard place. And she isn’t just eking out an existence under harsh conditions. She’s actually thriving – her leaves are supple and verdant, her blossoms number as the stars. If you look closely along the storm drain, you’ll see a sprinkling of her tiny, white petals; these represent acts of compassion to me, kindnesses falling soft as petals to cushion the hard places. Perhaps it’s unusual to emulate a flower, but I do. I want to be just like this little sweet alyssum – someone who faces hardship and blossoms anyway; someone who remains sweet in spite of difficult circumstances; someone who scatters petals of kindness to ease the path; someone who not only can survive life’s losses and challenges, but can grow through these experiences with grace and beauty. It’s just a simple little flower blooming by a storm drain in our turnaround, something most people would never notice or think twice about. But this flower has given me a new example of what it means to be strong.